Kroner Dry Cleaners Inc. is recognized for 25 years of BBB® Accreditation. Ray Kroner, President, accepted an award from BBB for his company’s longstanding commitment to the standards of Better Business Bureau Accreditation. 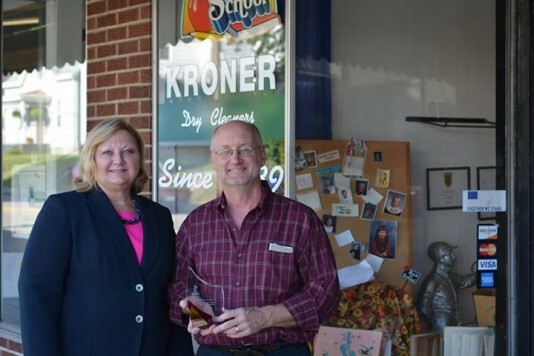 Kroner Dry Cleaners first opened its doors in 1939. Lou Kroner Sr. quickly earned a reputation for his meticulous service and thorough care. When Lou Jr. took over, he labored to maintain that reputation; when grandson Ray took charge, he did one better: “the combination of old world, hands-on care and state-of-the-art technology,” Ray says, “provides the perfect results.” Kroner Dry Cleaners’ current business model continues the classic service standards many other industries have left in the past by offering free pickup and delivery to most of the Westside and concierge services to downtown Cincinnati’s business district, while simultaneously pushing towards innovation with its various green initiatives. Congratulations to Kroner Dry Cleaners Inc.! Learn more about this company by visiting bbb.org.